Learn from best practice examples how to successfully implement policy to achieve zero energy goals. An increasing number of cities, counties, and states around the US are committed to reducing their greenhouse gas emissions. Here we provide a curated list of leading energy goals, policies, and energy stretch codes from states and local jurisdictions, as well as programs that support jurisdictions. Resources include strategic plans, energy and climate action plans, and stretch codes. The Advanced Jurisdictions Policy Map below identifies where policies are being implemented, as well as where further information is available (on this page or within NBI’s off-line zero energy policy database). For a full list of up to date policies, please visit the ACEEE State and Local Policy Database. On this map, the solid red dots indicate curated policies that are available on this page. Blue outlined circles indicate policies NBI is tracking offline, in our Policy Database. Hover over points to see the city and policy name. Zoom in or scroll for more detail. This is a growing list, contact Webly Bowles, Project Manager for more information. Policies, plans, programs, and energy codes can dramatically change the landscape for zero energy buildings. There is increasing market interest in zero energy, and policies and programs can foster and grow that interest through leadership, direct support, and the reduction of risks and uncertainties. Some states and cities are implementing mandatory zero energy policies. Leading state and local governments are working to pursue goals via methods ranging from standards imposed on government buildings, to codes regulating all new construction within the state. National leaders include California, Washington State, New York, Massachusetts, and Vermont. Building policies for agencies within the federal government have also made large strides in recognizing the importance of zero energy and working toward this goal. Aggressive targets for building energy use at all levels encourage architects and engineers to design for zero energy. Atlanta has made a commitment to power the city entirely on renewable energy sources, including solar and wind, by 2035. 100% clean energy will create local jobs for Atlanta residents, reduce air pollution and associated public health risks, reduce the strain on water resources and save consumers money. Priority will be given to the lowest cost measures to meet energy needs including weatherization, cogeneration, district heating and cooling, decentralized electricity generation and smart grids/microgrids, the use of industrial waste heat, building controls, automated lighting, solar-powered hot water heaters and programs that create an energy-saving culture in the City of Atlanta. A cost-benefit analysis of generation resources and energy sector employment will be developed as part of the plan. Executive Directive 2007-22 requires that all state buildings occupied by state employees be benchmarked using the ENERGY STAR Portfolio Manager tool. To date, over 1,000 of the State of Michigan’s 6,000 leased or owned buildings have been benchmarked. The Governor has also recently tasked the state energy office, Michigan Public Service Commission, and Department of Technology, Management & Budget to develop a plan to benchmark state-owned buildings. This project is expected to encompass approximately 1,100 buildings and is actively underway. In May 2008 Minnesota adopted “Sustainable Building 2030” standards designed to achieve energy consumption reductions of 60% in 2010 (from the 2003 baseline), increasing 10% every five years towards an ultimate target of 90% in 2025. Beginning on July 1, 2010, all Minnesota State bonded projects — new and substantially renovated — that had not already started the Schematic Design Phase on August 1, 2009, were required to meet the Minnesota SB 2030 energy standards. These progressive standards are to be upheld by Executive Order 17-12 for state agencies to improve their operational practices to achieve the sustainability goals of reducing energy consumption by 30% by 2027 relative to the 2017 adjusted baseline. The Clean Power Plan, finalized by the U.S. Environmental Protection Agency set the first-ever limits on carbon pollution from power plants, the nation’s largest source of the pollution that is driving dangerous climate change. This carbon pollution limit for power plants in Iowa is achievable, largely through increasing the state’s clean and renewable energy sources, along with improving the energy efficiency of its homes and businesses. Iowa will reduce its power plants’ carbon pollution from 38 million tons in 2012 to 25 million tons in 2030. Expanding the state’s clean energy resources will add jobs to the growing clean energy economy, which already employs more than 22,600 Iowans. Oregon’s goal is to achieve net-zero-energy-ready buildings as standard practice across the state. The Executive Order has outlined a three-pronged approach that considers efficiency in state buildings, new construction, and existing buildings. It will keep the state moving toward the Paris Climate Agreement goal while adding to the more than 40,000 existing efficiency-related jobs statewide and saving consumers and businesses money on their utility bills. The Austin City Council passed Resolution No. 20070215-023 in 2007 to formally adopt a goal to make the city operations carbon-neutral by 2020. Austin requires all departments to develop and implement climate action plans. All departments have performance measures related to their departmental carbon footprint. In accordance, the City of Austin Administrative Bulletin 05-01, all city departments and agencies must develop Departmental Energy Efficiency Plans. Additionally, in 2015 the City Council adopted the 2015 Austin Community Climate Plan (ACCP) via Resolution 20150604-048 to achieve the citywide net-zero greenhouse gas emissions by the 2050 goal and the target path to get to net-zero by 2050 including interim targets for 2020, 2030, and 2040 allowing for up to 10% of carbon offsets for all targets. In 2008, the CPUC adopted California’s first Long Term Energy Efficiency Strategic Plan, presenting a single roadmap to achieve maximum energy savings across all major groups and sectors in California. The comprehensive plan is the state’s first integrated framework of goals and strategies for saving energy, covering government, utility, and private sector actions. It calls for 50% existing commercial buildings to be zero energy by 2030, new state buildings and major renovations zero energy by 2025, and 50% existing state owned buildings zero energy by 2025. Vermont’s Comprehensive Energy Plan includes three primary goals: (1) to reduce total energy consumption per capita by 15% by 2025, and by more than one third by 2050; (2) to meet 25% of the remaining energy need from renewable sources by 2025, 40% by 2035, and 90% by 2050; and (3) by 2025, meet target end use sectors of 10% renewable transportation, 30% renewable buildings, and 67% renewable electric power. The Austin City Council adopted the Austin Climate Protection Plan (ACPP) in 2007 to build a more sustainable community. Every City department was subsequently tasked to create action plans intended to ensure that departmental operations were consistent with the ACPP. Austin Energy developed a Resource, Generation and Climate Protection Plan to 2020 to meet these objectives, which was approved by City Council in 2010 and later refined to include affordability metrics. In 2014, City Council passed a resolution that recognized the need to further accelerate the reduction of greenhouse gas emissions beyond the 2007 ACPP standards and set a goal of reaching net zero community-wide greenhouse gas emissions by 2050 or sooner. Additionally, the City Council appointed the 2014 Austin Generation Resource Planning Task Force to make recommendations on the utility’s generation mix to 2025 and to further set the energy sector of the City of Austin on a glide path to achieve the emissions standards set forth in the 2014 ACPP. The Greenovate Boston 2014 Climate Action Plan Update builds upon seven years of work in reducing citywide greenhouse gas (GHG) emissions and preparing for the unavoidable impacts of climate change. Beginning with the 2007 Executive Order, the City of Boston set GHG reduction goals of 25 percent below 2005 levels by 2020 and 80 percent by 2050 for municipal operations, and requires the City to plan and prepare for the impacts of climate change. The Cambridge Net Zero Task Force was assigned to study the technical aspects of greenhouse gas emissions from buildings in greater detail and develop comprehensive, actionable, long and short term recommendations. In June 2015, the Net Zero Action Plan was adopted by City Council. The report addresses the following topics: reduction of greenhouse gas emissions from the built environment, improvement of energy efficiency and conservation in existing and new buildings, support for renewable energy generation both on- and off- site, and best practices to engage and educate users and influence occupant behavior. Denver’s 2015 Climate Action Plan is intended to create a more resilient city by building upon existing efforts to limit the most severe effects of climate change through new strategies to reduce greenhouse gas emissions. In this plan, Denver sets a new long-term goal, in alignment with climate science, to reduce community greenhouse gas emissions 80% from its 2005 baseline by 2050. The city of Eugene aims to cut in half community fossil fuel use by 2030. Its climate action goals focus on reducing carbon pollution relative to historic levels. The city recognizes the need to reduce carbon pollution to at or below 350 parts per million in the atmosphere. The 2016 updated Climate Recovery Ordinance sets a goal to have Eugene’s emission levels at a 350 ppm level by 2100. At the municipal level, Eugene is targeting carbon neutral city operations by 2020. This is to be mainly achieved by an overall 55% reduction in GHG emissions from 2005 levels by 2020, with emissions offsets covering the gap between that reduction and all the way to net zero. To date, Fort Collins has reduced its greenhouse gas emissions five percent below 2005 by partnering, educating and inspiring the community. Now, pursuant to City Council Resolution 2014-028, this Climate Action Plan (CAP) Framework has been developed to explore what it would take to achieve reductions in community GHG emissions of 20 percent below 2005 by 2020, 80 percent below 2005 by 2030, and carbon neutrality by 2050. The Net-Zero Energy Building Standard project was sponsored by the City of Tucson Office of Conservation and Sustainable Development. Pima County Development Services, Building Safety and Sustainability was the principle research group with assistance from the University of Arizona College of Architecture and Landscape Architecture and Tucson Water. The Net-Zero Energy Standard has a prescriptive residential section and a prescriptive commercial section covering apartments, office and retail. These building types represent approximately 30% of total energy use in the metro area. The Net-Zero Energy Standard also has a performance section for both residential and commercial that will allow buildings that cannot use the prescriptive path to achieve a net-zero certification by using energy modeling software. New York has developed a voluntary stretch code which will provide local governments that wish to demonstrate leadership on climate change and reducing greenhouse gas emissions with a clear and high-impact opportunity to do so. “NYStretch” aims to provide a straightforward, flexible approach to achieving approximately 10 percent in energy savings for an energy boost beyond code for residential, commercial, and multi-family buildings. Part 11 of the Title 24 Building Standards Code is the California Green Building Standards Code, also known as the CALGreen Code. This is the first statewide green building standards code in the nation. The 2016 CALGreen Code became effective on January 1, 2017. All newly constructed buildings on new or existing sites shall comply with the CALGreen Code, Chapter 5. A CALGreen Code submittal to the DSA must include California Energy Code (Title 24, Part 6), Outdoor Water Regulations, and all other DSA mandatory measures. This code requires that the Delaware Energy Office, or its successor, in consultation with the Green Building Council of the Home Builders Association of Delaware, shall establish programs to promote the construction of zero net energy homes. A zero net energy home or building is defined as a residence or commercial building that, through the use of energy efficient construction, lighting, appliances and on-site renewable energy generation, results in zero net energy consumption from the utility provider. Therefore, a zero net energy capable home must be energy efficient enough that if the home or building owner chooses to add on-site generation, net zero energy consumption could be achieved. By 2025, all new residential building construction in the State of Delaware must be zero net energy capable. By 2030, all new commercial building construction must also be zero net energy capable. This act requires that residential and nonresidential construction permitted under the 2031 state energy code achieve a 70 percent reduction in annual net energy consumption, using the adopted 2006 Washington State energy code as a baseline. Furthermore, state energy codes shall be adopted until 2031 which incrementally move towards achieving the 70% reduction in annual net energy consumption. The purpose of this roadmap is to provide context for the policy and code performance goals for new residential and commercial buildings in Washington law and identify the mechanisms and cycles by which code provisions can evolve to meet these goals. These code improvements will occur in incremental steps and this document will help identify the order and priority that is needed to lay the groundwork for subsequent code and policy strategies to improve code language. The improvements can be mapped into the planned code cycles remaining between now and the target achievement date for Washington’s policy goals for building stock. The Roadmap will also identify scope and policy barriers as well as opportunities that will need to be addressed to achieve the long‐term goals identified. Under Boulder’s Energy Conservation Code, commercial buildings must achieve energy performance significantly exceeding national code baselines. Permit applications for commercial buildings larger than 20,000 square feet must utilize predictive computer modeling to demonstrate energy performance that is at least 30% better than ASHRAE/IENSA Standard 90.1. Permit applications for commercial buildings of 20,000 square feet or less may demonstrate energy code compliance by predictive modeling, but are also allowed to utilize approved prescriptive standards that achieve energy performance of at least 30% better than the 2012 edition of the IECC. The purpose of this standard is to provide both prescriptive and performance paths for designing net-zero energy buildings and net-zero energy remodels within the Tucson/Pima County climate. The prescriptive path is comprised of a series of high performance energy efficiency improvements that each building must incorporate. 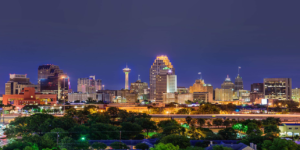 In 2015 the San Antonio City Council voted to adopt the 2015 International Codes, including the International Energy Conservation Code (IECC) for residential and commercial buildings. San Antonio is the first city in Texas to adopt the 2015 International Codes. This represents a milestone in the City’s efforts to improve the efficiency of new buildings and reduce energy costs for homeowners and businesses. Analysis shows that new homes will be 18% more energy efficient and commercial buildings will be 26% more efficient than those built to current code (IECC 2009). In 2016, Santa Monica City Council adopted the newly proposed Santa Monica Reach Code. The Santa Monica Municipal Code was updated in 2017 to include the following Energy Code Updates: all new low-rise residential buildings shall be designed to use 15 percent less energy than the allowed energy budget established by the 2016 California Energy Code, and achieve an Energy Design Rating of Zero; and all new high-rise residential buildings, non-residential buildings, hotels and motels shall be designed to use ten percent less energy than the allowed energy budget established by the 2016 California Energy Code. Cities striving for carbon neutrality recognize that averting the worst impacts of climate change will require cutting GHG emissions by at least 80% by 2050. Because urban areas account for nearly three-quarters of humanity’s emissions, reaching this goal will depend in large part on our ability to reimagine and reinvent cities in ways that promote economic prosperity, social equity, enhanced quality of life, and climate resilience. The Carbon Neutral Cities Alliance (CNCA or “Alliance”) aims to address what it will take for leading international cities to achieve these deep emissions reductions, and how these cities can work together to meet their respective goals more efficiently and effectively. Building owners need information about energy use in order to measure and manage it. However, many building owners do not have access to this information. Through the U.S. Department of Energy Better Buildings Energy Data Accelerator, local governments are joining forces with their local utilities to make it easier for building owners to get access to whole-building energy usage data for the purposes of benchmarking their buildings. Zero Energy Districts are an important pathway toward optimizing energy efficiency in new construction because of the cost savings and environmental and economic benefits they can provide. Specifically, Zero Energy Districts are designed and built to maximize energy efficiency and use renewable energy at a district scale. U.S. Department of Energy Zero Energy District Accelerator partners will demonstrate the practicality of taking action to cost effectively meet zero energy goals and commitments. By completing a detailed energy master plan, governance and business case model, and development pathway for a Zero Energy District, partners will identify the best practice approaches of considering well-defined energy performance goals and incentives for the entire building and district lifecycle. NRDC + IMT’s City Energy Project is a national initiative to create healthier and more prosperous American cities by improving the energy efficiency of buildings. Working in partnership, the Project and cities support innovative, practical solutions that cut energy waste, boost local economies, and reduce harmful pollution. The pioneering actions of the 20 cities involved in the City Energy Project will be models for communities nationwide and around the world. Since 2008, the U.S. Department of Energy’s (DOE) Zero Energy Ready Home program has recognized hundreds of leading builders for their achievements in energy efficiency, resulting in over 14,000 energy efficient homes and millions of dollars in energy savings. The DOE Zero Energy Ready Home, represents a whole new level of home performance, with rigorous requirements that ensure outstanding levels of energy savings, comfort, health and durability. The Zero Energy Project is a non-profit educational organization that aims to help home buyers, builders, designers, and real estate professionals take meaningful steps towards radically reducing carbon emissions and energy bills by building zero energy and near zero energy homes. The project envisions a future of positive energy homes which also power electric vehicles so everyone can live well with less expense and without fear of energy price spikes, while greatly reducing carbon emissions. In 2017, Consumers Energy will be implementing a new Zero Net Energy pilot program. This program engages the community, educates the building industry, and provides huge value in reducing the energy footprint in the region. The intent of the Zero Energy Pilot Program offering is to encourage building owners in the Consumers Energy territory to pursue whole building energy efficiency on their projects. The program encourages zero energy as a post-occupancy, measurable goal, by providing a suite of incentives (varying in dollar amount and requirements) to fund engineering support, cost-benefit analysis and post-occupancy measurement and verification. The Illinois Clean Energy Community Foundation’s Net Zero Energy Building Program will award grants of up to $1 million to new construction or retrofit projects that achieve site net zero energy performance, or better, over the course of a year. Buildings must, at a minimum, offset all of their energy consumption with on-site generation from renewable resources. Grants will be paid incrementally, with full payment contingent on actual performance. The program goal is to encourage exemplary buildings that bring together beautiful design and careful construction to maximize energy efficiency, showcase renewable energy and, by educating the public and professionals, help pave the way for a larger shift in the building sector. The Foundation aims to fund projects that demonstrate that net zero energy buildings are realistic and achievable. These flagship projects will add to the knowledge base on Net Zero building design and operation. California’s Statewide Energy Efficiency Collaborative (SEEC) provides support to cities and counties to help them reduce greenhouse gas emissions and save energy. The ZNE Hub, maintained by SEEC, serves as a comprehensive resource for local governments to better understand the current policy landscape and the range of resources currently available. It includes a general overview of zero energy implementation for local governments, broken down by common steps, and a compilation of barriers, best practices, case studies, and key references.